The issue is huge in shelters. It is an issue that splits the animal welfare community into bitter, angry factions. For those of us who spend our days working in open admissions shelters where animals are euthanized, the issue becomes deeply personal. When dogs with whom we’ve spent time, whom we’ve grown to love, for whom we take great pleasure in making a special treat, whose special scratch spot we get right every time, gets euthanized, it hurts. And then we have to find a place to put the hurt. Our species decided a long time ago that we were the masters, the owners, the breeders. We decided that we were the decision makers for canines long before we figured out that compassion and empathy should be part of any decision making process, long before animal behavior became an accepted part of science. We have failed them over and over again. And they pay. Some of us also pay, those of us who tend to the wounded dogs, those of us who suffer along with them, those of us who strive to give those dogs quality of life. Who gives us the right to say whether a dog will live or die? Well, we’ve given it to ourselves, haven’t we? We always have. We claimed it as our right long before we domesticated dogs. We make those decisions all the time, in many different situations. Do I think that euthanasia is a “necessary evil”? I do not believe that it is evil, but I mourn that it is necessary. In the big picture, when we stop doing bad things to dogs, and each other, and all other beings, then maybe there would not be a need to euthanize for behavior. Behavior can be a particularly troubling aspect, especially when it comes to dogs whose behavior issues don’t appear clear to us. Euthanasia is not what any of us want for any dog. What we had in mind was for her to have a good life in this lifetime, to think of her in a loving home, living the kind of life that we give to our own animal companions, one filled with daily doggie happinesses: love, outings to great places, a comfy bed, yummy healthy food, playtime, a fine belly rub, lots of kisses. 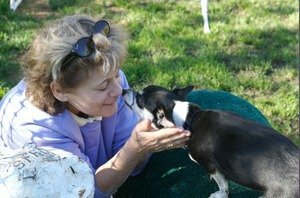 Quality of life for shelter dogs includes affection. At the same time, I know that the only ending for some dogs is euthanasia. It is heartbreaking when members of our species have wronged some dogs so badly that that those dogs cannot safely live in our community. I think of some of the dogs I’ve known through the years – Sparkle, funny, affectionate, and so very, very alive, but she was so dog aggressive that she could not even look at another dog without becoming an uncontrollable dervish of a dog, her ferocity unbelievable and uncontainable. 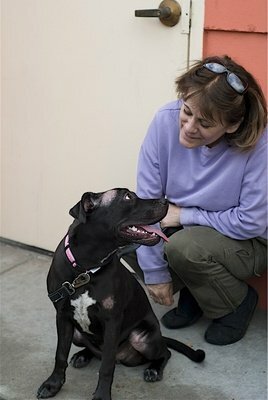 She bit a volunteer so badly on a redirect that the volunteer was bruised for weeks afterwards where Sparkle had bitten and broken skin. Sparkle being Sparkle, her euthanasia was one of the most loving and ungraceful that I have ever been privileged to be a part of. She made us laugh and wiggle right along with her until she was gone. I think of Hershey, who lived an absolutely horrendous life before he was impounded due to an owner cruelty charge, who lived in the 109 double run for close to a year before he was euthanized because he had developed cancer of the jaw. This dog was one who really resisted trusting anyone for such a long time and for such good reason that I believe his mistrust of any of us would have led him to hurt us badly had he ever been allowed out of his kennel. Although he was euthanized for medical reasons, his human aggression was so over the top unpredictable that he never would have been safe in any community. We did have breakthroughs with him from time to time, but we never changed who he had become. That would have been impossible. It was too late for Hershey. It was also too late for four pups who were born in the shelter that same year and lived there for nine months. We raised them as well as we could before an owner redemption that seemingly came out of nowhere. Six months later they were impounded on an owner cruelty charge by another agency, where they were subsequently euthanized. I visited them there, and was stricken to see who they had grown up to be. Those puppies were born damaged and then damaged even further by an unscrupulous owner. They never had a chance. They did have moments of happiness, of frivolity, of love and silliness, but they aroused unpredictably to the point of dangerousness in a split second from the time that their eyes first opened. Had I not seen it, I would have found it difficult to believe that puppies were capable of showing such human and dog aggression. Quality of life for shelter dogs includes physical exercise. Fiona, a huge gorgeous Mastiff, was in on several bite complaints, and lived behind the green door twice in her young life, the final time for a long seven months. Was it her fault? Fi had an unstable owner who had established no boundaries with her dog, giving constantly conflicting signals, raising her hand to her, leaving her hungry and cold and alone for long periods of time. Yet she loved her. Was love enough? There are dogs who are less obviously damaged but equally as ill equipped to live in our community as companion animals. We do our educated damndest to suss them out. We look at a Pittie who does not care a whit about people and know how wrong that is. A non-affliative Pit Bull is not a diamond in the rough, but rather a hidden land mine. Pitties were bred to love people unreservedly, and one who does not is not safe to live in our community. My boy Bart comes to mind. I had adopted a young cruelty victim, a handsome blue Pit, whose life with me lasted only four short months. I had sensed something not quite right before I even took him home, but my desire to give him a good life, and my inability to name what was wrong, even after four years of working with the custody and isolation dogs in Give a Dog a Bone, blinded me to indicators that became apparent to me later on. I began asking just about every trainer I knew to assess him; I took him to a behaviorist whom I unreservedly trust, only to have my fears confirmed. Bart did not care about me. He did not care and it hurt. He was going to harm me or someone else. He was already throwing body slams and muzzle punches. I think of a big neutered male who approached my own big girl Pepper in the park last week. His owner, who noticed that I was quietly herding Pepper away from her dog, told me that he was “friendly.” She was mistaken. There was nothing friendly about his approach. His unmoving tail was high and curved upright – a tail position that many people mistake for friendliness. His body was stiff, ears erect and forward, and his mouth a tight closed line. He approached my dog rapidly, directly, and purposefully. Nothing happened though. Pepper responded with signals that were the opposite of his, with a serene and slow turn towards him, soft wavy tail, relaxed ears, open relaxed mouth, which defused a potential nasty situation. Should that dog be in our community? I think that dog will make a serious mistake at some point in his life and hurt another living being. Given a choice, do we want an iffy dog living in our neighborhoods, around our children, our grandparents, our cats, and our other dogs? If the choice was between euthanizing the dog or having the dog live next door to our families with his family, which included children, what would we do? What decision would any of us make? Here’s something else to consider. Is there someone out there for every dog? Shall we hold on to a dog, despite his ever diminishing quality of life, while we wait for that good home to show up? We can’t count on that. We know more about dog quality of life than we ever have before. Is it moral to keep a dog alive for the sake of life itself if that dog is suffering because of his life? We are bound to honor and cherish dogs’ lives as we would like our own to be honored and cherished. 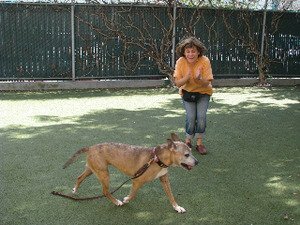 Quality of life for shelter dogs includes positive reinforcement training. None of this is easy stuff. We who have taken the steps of giving quality of life to dogs behind the green door, some of whom have been irreparably harmed, others to whom life has thrown a lazy curve ball, and yet others who have lived with people who just don’t know any better, that’s what we do. We treasure each dog as if they live inside our souls. Working with disenfranchised dogs for whatever reason they’ve been put in front of us is tough work, but also lovely and funny and warming as hell. Our mission is to do the absolute best for them while they are in our care. The reality of accomplishing that mission will break our hearts at times. How do we ready ourselves for that? How do we cope? We need to talk about that with one another. We have to open ourselves to that discussion. In open door shelters, volunteers choose to work side by side both with people who make euthanasia decisions and with those who have to euthanize because it’s part of the job. Each of them deserves our compassion, our understanding, and our respect. We must pay tribute to the inner strength that it takes to euthanize. We must be generous with our support. We must never second guess the decisions nor the act. During those times, it is our place and our obligation to find a place to put our own hurt. Our feelings of hurt, or anger, or of helplessness, are not feelings to be handed to those whose work it is to do what at times seems unfathomable. We are not judges. We, all of us, spend hours and days, years, in our shelters for the same reason: we care. In the end, in 2011 and for the foreseeable future, it comes down to the individual. “Who are you?” we ask each dog, “are you a safe dog, will you have quality of life?” For now, and for always, our best answers to those questions will have to do. “You matter because you are you. 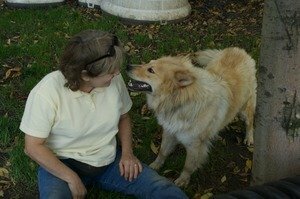 Corinne Dowling created and founded Give a Dog a Bone (GADAB), a nonprofit organization devoted to environmental enrichment and quality-of-life programs for a group of dogs never seen by the public. Her enrichment techniques include providing mental stimulation, physical exercises, emotive interactions, stress relief, positive rewards-based training, and canine-specific pleasurable activities (i.e., play!) for dogs in long-term shelter care. GADAB’s intent and purpose is to address shelter dogs’ needs individually as well as holistically. December 2011. All rights reserved. This article may not be edited nor reprinted without the permission of its author. This article is the intellectual property of Corinne Dowling.